Many adjustments influenced Dota 2 in the past two years. The meta greatly varied, and now we live in one of the most balanced iterations of the game ever released - but only for competitive gaming. During The International 7, only four heroes were not picked or banned, and one of them was Techies, who isn’t enabled in Captains Mode. The number of games and tournaments isn’t an issue either: there is Dota available at almost all hours of the day thanks to the new Dota Pro Circuit, which introduced 11 Majors and 16 Minors for the next eight months of competitive season. The decline in the number of players is due to the actual meta in pubs, and to the struggle that new players meet when approaching our game. Dota has always been a game created for an “elite” of players ready to accept that they need to study, practice, and learn from others to improve and achieve results. This isn’t what the majority of new players is looking for. For example, now is possible to check the exact area covered by a ward before placing it, or the range of a tower. But this isn’t enough if we want to attract new players. The problems of Dota 2 from a new player’s perspective. The games are too long. Not everyone can dedicate 40 minutes/1 hour of his life to a match. Losing is not fun. It doesn’t matter if the overall game was enjoyable and well-fought: many just don’t like to lose. The problem is accentuated by the time required to lose a game. Even if your team got dominated, games rarely end before the 20-25 minute mark. Playing the game isn’t sufficient to learn it. Practice helps a lot, but to become a better player in Dota one should read some guides, or at least watch streams or gameplays of pros or high ranked players. Pro games are balanced, pubs aren’t. Almost everyone plays All Pick, where all heroes are allowed. Valve gave us the opportunity to ban some heroes, but that’s not enough. Pub games are filled with Necrophos, Viper, Venomancer, Earthshaker, and other heroes that are a real pain to deal with. At high ranks, players know how to behave and counterpick them - but, most of the players have 2-3k rank, and there this sort of knowledge isn’t widespread. The Behaviour Score. It is a score that determines your behaviour in a scale from 1 to 10,000. No one knows exactly how it works, and how it influences our games, but apparently now new players are queued together with those that have a high score. Theoretically, it is a good idea to place new players with good community members, avoiding flamers and leavers. But, there is a big issue: even players with 5-7k rank and with thousand of hours are queued with new ones, which results in very unbalanced matches and a lot of frustration for the veterans. Recently, a huge number of players moved over PUBG, which topped the charts becoming the most popular game on steam. A defeat can happen at any time, even 30 seconds after landing, so people won’t get frustrated for wasting 1 hour of their life. I played it quite a lot already, and I can confirm that you will always have fun, even if you don’t win. The mechanics of the game don’t require the study of guides. PUBG is a perfect example of what most people are looking for: a quick game they can master with a little of practice, and that they can leave at any time. No commitment is needed - if you are suddenly busy due to family or work, you can just leave the game without any penalty, and without ruining someone else's match. 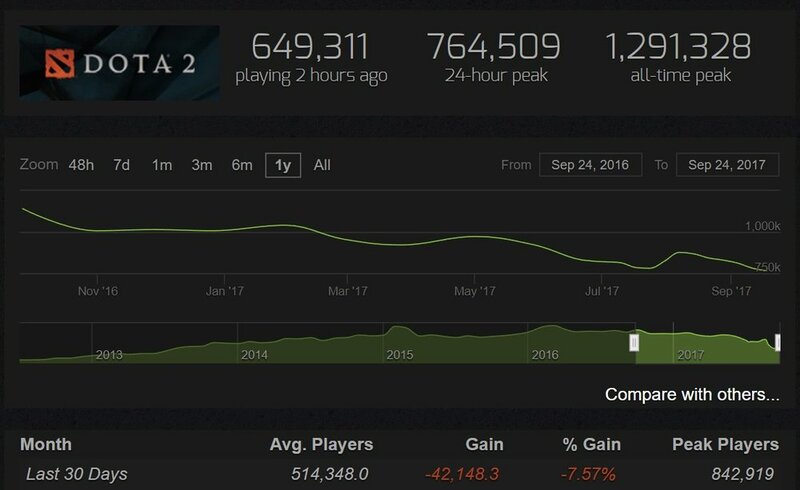 A big factor, that is influencing the decline of players in recent months, is the lack of a new patch. Everyone was expecting Dota 2 7.07 after The International 7 ended, but recently Valve stated that The Dueling Fates update will require one month more before being ready. This is honestly a big mistake - having the new version of the game ready a month earlier would have drastically altered the current situation. At the end of the day, you are wrong if you think that Dota 2 is going to die. No other esports features such a big number of tournaments and money involved, and from a spectator’s viewpoint Dota 2 will continue to shine. What we need is something to refresh the meta, especially the pub one, and ideas on how to attract new players into the game.